and I knew that satisfaction lay behind my pantry door. ‘round my kitchen, no one peeping as I tiptoed ‘cross the floor. for one Kit-Kat, nothing more. tucked inside each nook and cranny after purchase from the store. bought for goblins who come knocking, trick or treating at my door. Oh, those Kit-Kats I adore! thrilled me – filled me with a crazy craving that I’d felt before. and let appetite run riot, scarfing Kit-Kats by the score. till the bag had nothing more. you can bet that I’ll be caving – misbehaving – that’s for sure. one by one, they disappeared as through the bulging bags I tore. 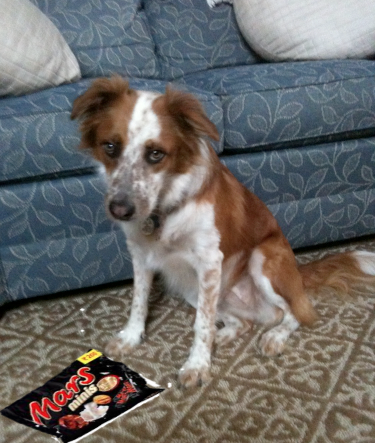 Milky Ways, Three Musketeers — their wrappers spilled upon the floor. Then: just wrappers, nothing more. what I’d have to tell my kids and those who’d knock upon my door. What excuses would deceive ’em? Lies I’d tell, who would believe ’em? How explain my thievin’ of the candy bought mere days before? up I headed to my bedroom, with a vow I firmly swore. and denying my own role in its depletion yet once more? Dare I tempt my will again with bags of chocolate bars galore? This entry was posted in Growing Pains and tagged craving Halloween candy, families, Halloween candy, Halloween humor, Halloween poem, humor, Mom ate all the Halloween candy, mom humor, moms, motherhood, parenthood, parenting, parenting humor, trick or treat rhymes, trick or treating, well-versed mom. Bookmark the permalink. Your POEtry is scrumptious. Evermore. Haha this is great– sadly my household is only me and my dog so she knows the truth if I try to blame her. Yes, what Annette said! Damn Carlotta, perfect in so many ways. this is so clever! funny and fabulous! ABSOLUTELY. DO NOT LET YOUR DOG EAT KIT-KATS. (Or any other chocolate. Or the animals, for that matter.) Thanks, Gary! Great job! Love the audio. Mmmm…. Kit Kats! I wish my thighs would disappear, though through my bulging jeans they tore.